SINGAPORE - Singapore Airlines (SIA) has been named Airline of the Year for 2019 by airline safety and product rating review website AirlineRatings.com. The national air carrier jumped two places from its 2018 ranking, beating five-time winner Air New Zealand, which dropped to second place, and Qantas, which fell to No. 3. SIA's first class suites were also named the best by the website. The results were announced last Tuesday (Nov 13) as part of AirlineRatings.com's Airline Excellence Awards. Other accolades presented include best long-haul airline, best low-cost airline, best catering and best lounge. "In our objective analysis, SIA came out No. 1 in many of our audit criteria, which is a great performance," said AirlineRatings.com editor-in-chief Geoffrey Thomas of SIA's top spot. "For years, SIA has been the gold standard, and now it is back to its best, leading in passenger innovations and new state-of-the-art aircraft models." 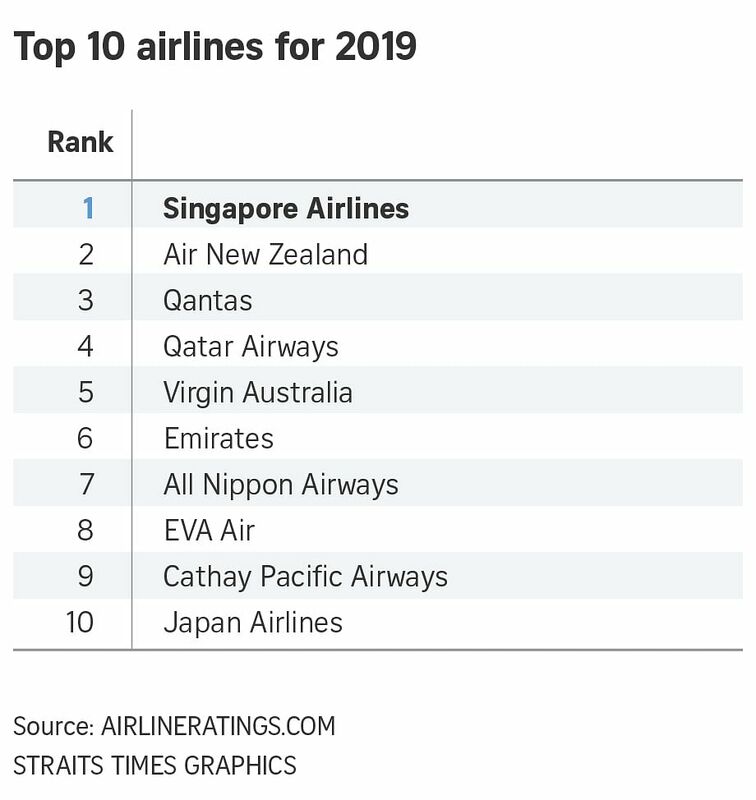 The other airlines in the top 10 for 2019 are Qantas, Qatar Airways, Virgin Australia, Emirates, All Nippon Airways, EVA Air, Cathay Pacific Airways and Japan Airlines. To be named in the top 10, airlines must achieve a seven-star safety rating and demonstrate leadership in innovation for passenger comfort, according to AirlineRatings.com. The website's editors looked at the results of important safety and government audits, as well as 12 key criteria such as fleet age, passenger reviews, profitability, investment rating, product offerings and staff relations.